95% R( α ) lipoic acid; contains 20 mg of sodium per capsule. 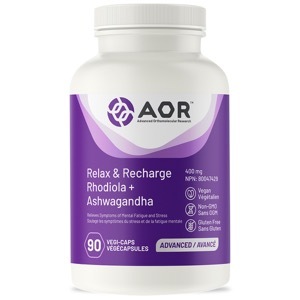 Relax & Recharge™ is formulated with Rhodiola and Ashwaganda, a combination of two powerful adaptogenic herbs. Rhodiola has been traditionally used for reducing anxiety and improving physical and mental fatigue and Ashwagandha is one of the most vital herbs in ancient Ayurvedic medicine it is best known for its restorative benefits and has been prescribed for the purposes of enhancing memory and strengthening the immune system. Primary Uses: Adaptogens increase the body's resistance to stress by increasing the brains stress tolerance and mitigating the harmful effects that stress has on the body. Rhodiola's main biologically active compounds, rosavin and salidroside support the levels of critical brain neurotransmitters which impact mood and energy. Ashwagandha enhances the activity of key immune cells to improve their ability to defend the body, especially in times of stress when infections are more likely to happen. Studies show that Rhodiola and Ashwagandha also reduce levels of the stress hormone cortisol. Cortisol is high in chronically “burnt-out” or stressed individuals and has been implicated in numerous degenerative diseases. Together, Rhodiola and Ashwagandha work synergistically to promote healthy mood and mental state, concentration, energy and immunity. Secondary Uses: Studies show that Rhodiola has beneficial effects on improving exercise parameters such as reducing skeletal muscle damage, improving fat metabolism and overall endurance. Relax & Recharge™ is ideal for individuals who feel chronic or acute anxiety, sadness or “burn-out”. Relax & Recharge™ improves focus and stamina, which would benefit students, shift works and individuals who need extended metal energy. Take 1 capsule three times daily for healthy glucose metabolism. Take 1 capsule one to three times daily for cardiovascular health and antioxidant support. For migraine prophylaxis, take 1 capsule two to three times daily for a minimum of 3 months. Take with food, or as directed by a qualified health care practitioner.